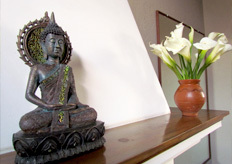 Healing Hands, Antigua's only professional therapeutic spa was founded in 2004 by Micky Morrison, a U.S. trained and licensed physical therapist. After starting her physical therapy practice on her own, Micky soon realized that she needed more "healing hands" to meet the growing client demand. Micky used her years of experience as a manual physical therapist to personally train her staff in a variety of therapeutic massage techniques. Over time, what began as a small physical and massage therapy clinic transformed into the world-class full service spa you see today. What distinguishes Healing Hands from other spas in the area is the professional level of expertise. Every service at Healing Hands is performed by a highly qualified professional. Micky herself traveled to Thailand to train in advanced Thai massage techniques and returned to train her staff. Later she studied under a German shiatsu master for an intense course alongside two of her staff massage therapists. The level of training and high standards of quality control sets Healing Hands apart from the pack, and can be found at no other spa in the city of Antigua nor in the entire country of Guatemala. The fitness center and movement studio offers clients a fully equipped gym for therapeutic and general fitness needs as well as a full gambit of classes including power yoga-lates,strong seniors, and pre- and postnatal fitness. Class offerings are constantly changing, so please contact us for more information on class availability and schedule. You can purchase a daily, weekly or monthly membership to use the fitness equipment. See fee schedule for details. Healing Hands moved to its current location in February 2009. The spacious colonial-style house is centered around a lush tropical garden whose fountain's soothing sounds flood the space with tranquility. Clients enjoy top rate services in one of five luxurious treatment rooms, all equipped with professional massage tables complete with warming blankets under the cozy flannel sheets to make every experience comfortable and relaxing. Enjoy a manicure, a pedicure, or just a relaxing moment with a hot tea in our Japanese garden.